Who is Poised to Hit in the Postseason? 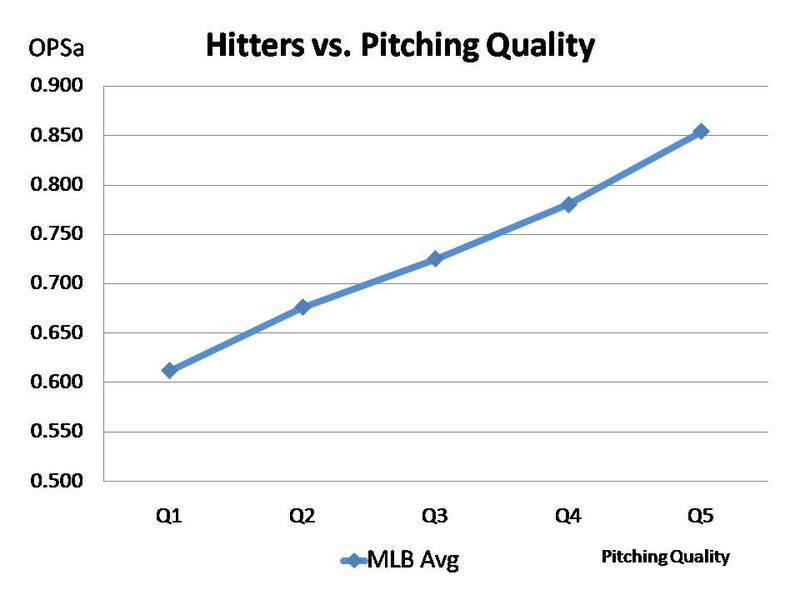 I analyzed the distribution of pitching over a 3-year period, with the ultimate goal of quantifying who pitches—or more accurately, what quality level pitches—in the postseason. I limited my study to starting pitchers, classifying them into 5 tiers (quintiles) of quality. Those which had the lowest opponent OPS (we’ll call it OPSa for OPS against), were in the top quintile, representing the top 20% of starting pitchers. The next 20% in OPSa were consider the 2nd quintile and so on, with the worst 20% representing the 5th quintile. The top pitchers (Q1 on the graph below) averaged a .612 OPSa, the second best quintile averaged .676 OPSa and the 5th (worst) quintile averaged .854 OPSa—that’s right, the worst 20% of starting pitchers logged an opponent OPS over .850. I controlled for the lefty-righty factor by defining a pitcher’s quintile against LHH and RHH, separately. For example, it’s not enough to say that David Price is a top quintile pitcher. We need to distinguish between his performance vs. LHH (top quintile in 2011) and vs. RHH (2nd quintile in 2011). 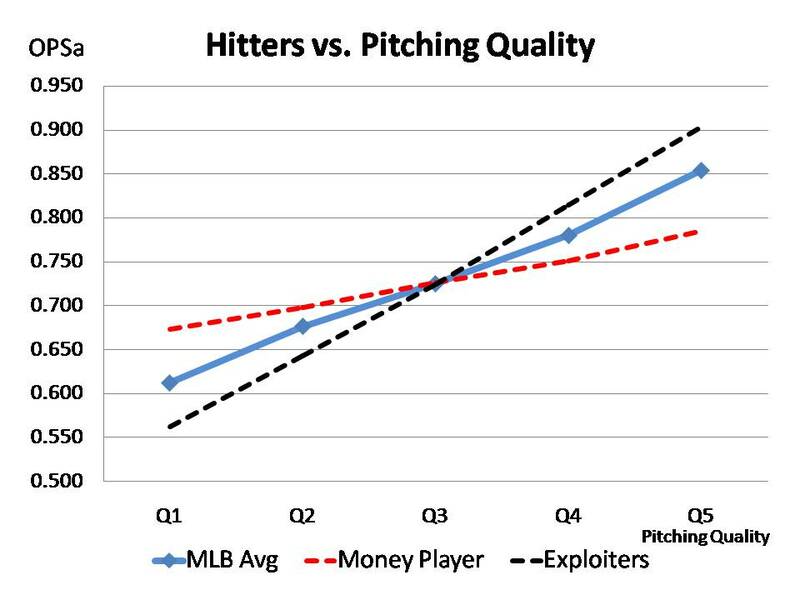 Below is a graph that depicts the way in which a pitcher’s OPSa differs for each quintile. I then turned my attention to postseason starting pitchers to determine how many innings came from each of the five quintiles. Over the three-year period examined, about 37% of the postseason games started came from the top quintile and another 28% came from the 2nd quintile, with only 7% coming from the worst quintile. In other words, nearly 2/3 of all postseason starts came from the top 40% of starting pitchers. News flash—the pitching is better in the postseason. We knew that, but now I’ve quantified it. If we added relievers to our analysis, I would expect we would see an even greater quality skew in the postseason as managers opportunistically find a way to put their best relievers on the mound in the many high leverage situations they face. Now that we’ve established who pitches in the postseason, let’s turn our attention back to the question I posed—which hitters are likely to be successful in the postseason. To answer this question, I measured how each hitter fared against the 5 quality quintiles of pitchers, then translated that performance into the postseason, based on the different mix of pitchers. Some hitters do proportionately well against each quality level of pitching, others feast on poor pitching, while being stifled by top pitching—we’ll call them the “Exploiters”, because they exploit weak pitching. Finally, there are hitters who hit disproportionately well against top pitching, but only a little better against weak pitching—we’ll call them the “Money Players.” The graph below overlays the Money Players and Exploiters on the graph with the MLB average. The line for the Exploiters is steeper, while the line for the Money Players is flatter than the league average. The data for two current Yankees makes them prime examples of the two types of hitters. Derek Jeter’s hitting pattern tends to follow the profile of the Money Player. He has a lot of success against the best pitchers and hits only marginally better against the weakest pitchers. On the other hand, Alex Rodriguez performance against various types of pitching resembles the Exploiter. A-rod tends to suffer against top pitching, while seriously outperforming the MLB average against weak pitching. Of course this is all relative, because he is a better than league-average hitter, so let me put this in perspective. A-Rod out hits the league average against top pitching by about 15%, but he beats the league average for the worst pitching by about 35%. Think of it this way: If all of MLB’s pitching was the top 2 quintiles—in other words, the bottom 60% of starting pitching evaporated—Alex might not be a star. Conversely, if that scenario played out, I would expect Jeter to be even more of a hitting star than he is today. In fact, the scenario I just described—a league dominated by the top 2 tiers of pitching—sounds a lot like the league we call the playoffs. By profiling each hitter against different quality levels of pitching, we can create an expectation about how they might perform in the postseason. Of course in the short run, with a small sample size of any one playoff year, the results can vary widely, nor does this approach directly consider a player’s “makeup” or inform us as to how he deals with high pressure situations. Nonetheless, since pitching is better in October, we should expect every hitter to have some degradation over their regular season hitting performance. (Remember, 65% of postseason starting pitching comes from the best two quintiles of pitchers and only 7% of from the worst (5th) quintile.) But simply put, a player who hits well against really good pitching—the Money Players, like Derek Jeter—should perform relatively better than other players in the postseason. Conversely, players who struggle against top pitching—the Exploiters, like Alex Rodriguez—should perform relatively worse in the postseason. Using this analysis, let’s project both Jeter’s and A-Rod’s postseason performance. They currently have nearly an identical OPS for this season—.800. Based on our analysis I expect Jeter would bat .775 in the postseason, while A-Rod would hit .740. In other words, Jeter would degrade only 25 percentage points from his regular season performance, but A-Rod would decline 60 points. This is certainly not a fool proof projection framework, but it is another way to evaluate a player’s likelihood of performing in the postseason, by basing it on how he fares against different quality levels of pitching, acknowledging that he will see mostly the best pitchers in October. As we get into the playoffs, we’ll take a look at some of the key players and create a projection based on this methodology. I’ve always been fascinated with pitching. I’m not sure why, but I love to analyze pitching, including talking to scouts about it and making it one focus of my research and analysis. In past posts I’ve referred to my Starting Pitcher Rating System and Rankings. I developed this metric over the past two years in response to my dissatisfaction with the way in which existing stats measured a starting pitcher’s contribution to his team. Many traditional baseball stats tend to measure things in a vacuum, often missing the important interactions, such as the impact of the quality of the opponent on a player’s performance. Our traditional stats may be adequate (in some cases) to record and measure a player’s performance, but in their raw form are a poor indicator of his talent or skill. One reason is that traditional baseball stats typically measure the outcome of the batter—pitcher matchup, giving little consideration to the skills or attributes of the two parties. I’m not only interested in the outcomes, but also how the batter or pitcher got to that outcome—the process measures. In developing my Starting Pitcher Rating System (SPR), I started with the definition of what baseball people value from a starting pitcher, with the ultimate goal of efficiently preventing runs. 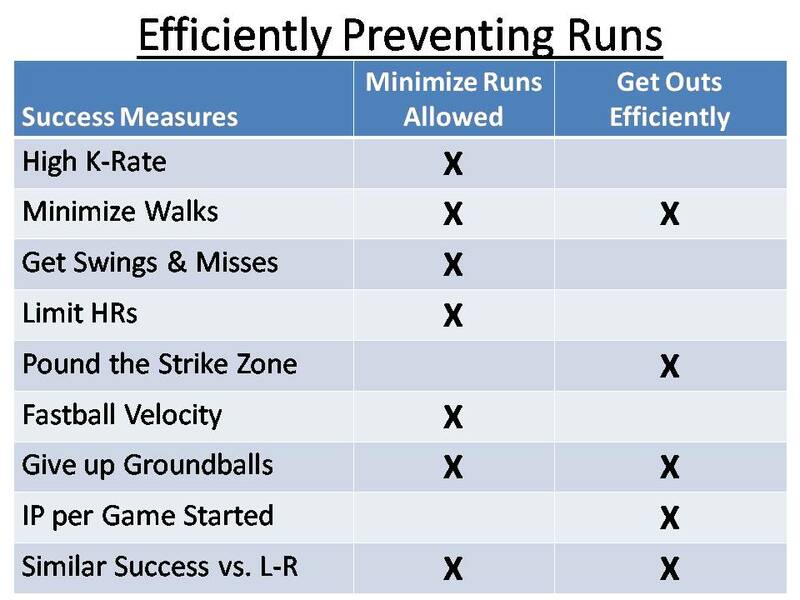 I looked at the things we ask a starting pitcher to do to accomplish that goal and categorized them as to whether they are focused on minimizing runs allowed, or getting outs efficiently. Valuing Groundballs vs. Flyballs—While batting average on groundballs is slightly higher (.234) than average on flyballs (.219), slugging percentage on flyballs is significantly higher (.580 vs. .253 for groundballs). As a result, flyballs generate runs at a rate 2.5 times greater than groundballs. If an extreme groundball pitcher (e.g., Trevor Cahill of the Diamondbacks) and an extreme flyball pitcher (e.g., Colby Lewis of the Rangers), pitched equally effectively with the only difference being their batted ball tendencies, Lewis would yield 12% more runs and have a .030 higher OPS against, over the course of a season. Pitching Deep into Games—In a recent study, I quantified the value of pitching deep into games, by analyzing the quality of relievers that typically pitch each relief inning–from innings 5 thru 9. The average OPS against relievers who pitch the 5th and 6th innings are .790 and .760, respectively. Relievers who cover the 8th and 9th innings have an OPS against of .690 and .670, respectively. The difference between starters who are “horses” and go deep into games vs. those who don’t is the the number of games they force their team’s bullpen to cover portions of the 5th, 6th, and 7th innings. Starting pitchers who fail to go deep into games, force the team to employ their weakest arms. Also, by adding bullpen innings, they reduce their manager’s flexibility in deploying the optimal reliever at key high leverage points during the game. Narrow Platoon Splits—One of the key differentiators of a starting pitcher (versus a reliever) is the ability to pitch effectively to both righty and lefty hitters. Lefty relief specialist Clay Rapada of the Yankees is a good example of a pitcher who does not effectively pitch to both lefty and righty batters. He has a stellar career OPS against lefties of .502, but yields a 1.043 OPS vs. right-handed batters. Effective starting pitchers don’t have 500+ point differentials in their splits. The average difference in OPS splits for the top 140 starting pitchers (which includes teams’ 4th and 5th starters) is 109 points. Quality of Opposition Adjustment—The array of teams a starting pitcher faces often gets overlooked when judging his performance. For example in 2011, CJ Wilson started 34 games. Fourteen of his starts were against teams in MLB’s lowest offensive quartile (as measured by OPS). Conversely, Toronto’s Ricky Romero had one of the toughest schedules of any starting pitcher, facing 1st and 2nd quartile opponents in nearly 70% of his starts. The SPR includes an adjustment to each starting pitcher’s stats to reflect the quality of the opponents he faced. According to the SPR, if the season ended on 9/2, King Felix would be the choice for the AL Cy Young award. The NL is much closer with RA Dickey having a slight lead over Cliff Lee, Clayton Kershaw and Cole Hamels. Undoubtedly some will be surprised at the ranking of both CC Sabathia and Cliff Lee in the top 5 starting pitchers this season. Regarding Sabathia, his last two starts (which are not included in this ranking) will clearly lower his rank and likely drop him out of the top 10. Cliff Lee is another story entirely. Despite his 4-7 record, it’s difficult to not give him accolades for another tremendous year on the mound. He excels at nearly everything we want a starting pitcher to do. He strikes out 6.5 times as many batters as he walks. He pounds the strike zone, throwing the highest percentage of strikes of any starting pitcher. In fact, he throws first pitch strikes to 71% of the batters he faces. His efficiency allows him to go deep into his starts. 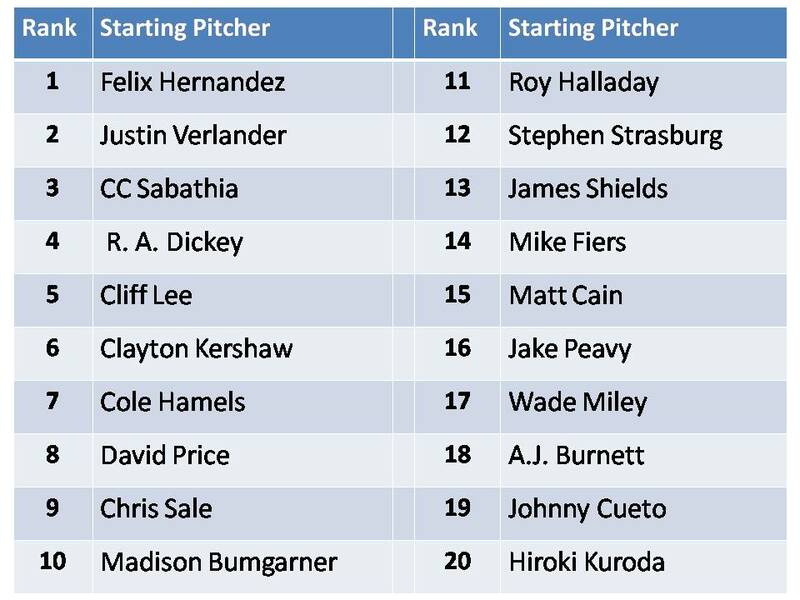 Only King Felix and Verlander have more innings pitched per start. I hold no illusions that Cliff Lee will win this year’s NL Cy Young, but it’s easy to make the case that he is not pitching poorly this season. Another pitcher that scores consistently high in the SPR is James Shields. It’s probably a main reason I have come to regard Shields as one of the very best pitchers in baseball. On MLB Network I’ve raved about Shields as the leader of the best pitching staff in MLB. Last year he was ranked behind only Justin Verlander as the #2 pitcher in the AL. Despite having an “off year” this season, he ranks #13. There will be more on the SPR in future posts. Baseball analysts often toss around dollar values of players, accompanied by an assessment of whether a team overpaid or underpaid to sign a player or acquire him in a trade. The commentary can be confusing for several reasons, including the uncertainty over which definition of value the analysts are using. To take a step back, let’s talk about the various definitions of the dollar value of a player. It seems that when the above references of “overpaid/underpaid” are made, they often refer to market value of a player. Even the definition of market value can be confusing, so we’ll come back to that later. Another way to define player value is to analyze his value to a specific team, basing it on the team’s unique circumstances, such as their revenue opportunity from improving their win total, which is driven by their market size, excess seating capacity, location on the win-curve (i.e., are they contending for a postseason berth), etc. A third definition of value is to estimate a player’s asset value to his team. This is often a way to assess the fairness of a trade. A player’s asset value refers to the value of a team having control of the player and includes a calculation using the player’s salary, relative to some value estimate (e.g., either of the two value definitions referenced above), over the number of years he is under team control. For a simplified example, let’s say a team acquires a player making $5 million per year for two more years, but his “value” to the team is $8 million. His asset value would be 2 years X $3 million per year for $6 million (not counting the time value of money or amending his value for any risk factors). It might be considered a fair trade if the team gave up a player whose salary is $4 million per year for one year, but his “value” to the team is $10 million per year. In this simplistic example, the team would be acquiring a player and giving up a player with approximately the same value—$6 million. Asset values can get very interesting when a player is being paid “at the market” or even above market value, as is the case with Cliff Lee. The Phillies lefty is owed a minimum of $87.5 for pitching the next 3 seasons ($25m per year + a $12.5m buyout of 2016 option). However, if Lee’s $27.5 million option vests, then a team would be obligated to pay Lee $102.5m over the next 4 seasons. There are only a limited number of circumstances in which Lee would have a positive asset value to a team. The team would need to believe that Lee was the last piece of the puzzle and the difference between possibly missing the playoffs versus a deep run into the postseason. Furthermore, they would need to believe they would be competitive over the four year span of Lee’s contract. Just reaching the postseason once, with Lee being a difference maker, would likely not foot the bill. On top of that, a team would likely need to give up a player in order to get Lee. I happen to love Cliff Lee as a player. My Starting Pitcher Ranking system has him in the top 10 of all starting pitchers this year—a year in which he’s won only 4 games! Despite my accolades for Lee, an example of a fair trade may be the Phillies giving up Cliff Lee and Domonic Brown, a disappointing, highly touted prospect with a couple of years of control remaining at pre-arbitration rates, in exchange for a low-level minor league prospect. In other words, trading Lee and a player with a low asset value (Brown), in exchange for another player with a low asset value. When assessing a player’s asset value, even the top players in the game can get “upside down” with respect to value versus salary. Regarding the market value of players, I’ve statistically modeled the last ten years of free agent signings in order to develop a framework as to how teams value various attributes of a player, such as his age, position, handedness, recent past performance, along with several other factors. But think of this as a generic valuation, not a team-specific valuation. For example, in last year’s free agent market, my model valued Michael Cuddyer at $11 million per year for 3 years. As it turned out, Cuddyer signed a contract with Colorado for $10.5 million X 3 years. In this instance, my estimate of the market rate turned out to be very close to his actual contract value. However, if the Yankees were in the market for Cuddyer, they possibly could have valued him at a higher dollar amount, based on their unique revenue opportunities. It’s interesting to look back at how the free agent market valued position players and pitchers over the last several years. Keep in mind there is a difference between what teams expect to pay for performance versus what they actually pay for performance, since the pay is set before the performance is delivered. I tallied all one-year free agent deals for the last eight years, capturing the player’s one-year compensation and their wins above replacement (WAR from FanGraphs). The results are listed below. It’s interesting to see the high water mark in terms of cost per WAR was 2008. 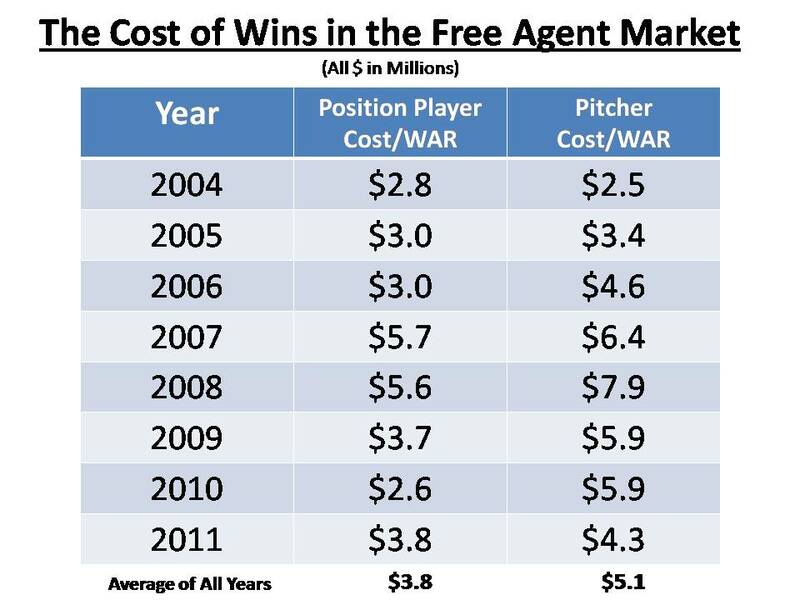 Teams spent nearly $8 million per win for pitching free agents and $5.6 million per win in the position player free agent market in 2008. A few closing thoughts on a player’s value to a specific team. This can be estimated by analyzing their revenues in the context of their on-field performance. 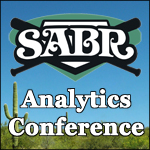 I want to emphasize that statistical models of a team’s win-curve (whether from actual team financial data or estimated financials from publicly available information) is just one input into understanding a complex question: how do revenues respond to on-field performance? In much the same way statistical analysis of a player’s performance must be integrated with scouting reports, a medical assessment, an evaluation of the player’s makeup and other factors, before a complete picture can be created, the same applies to the estimation of how winning will impact revenues. Revenues are the result of consumer behavior—fans’ unique response to changes in team performance. The items that need to be considered when creating a more complete picture of a team’s win-curve are fans expectations of team performance, their motivations, and the time lag between performance and fan actions, among others.